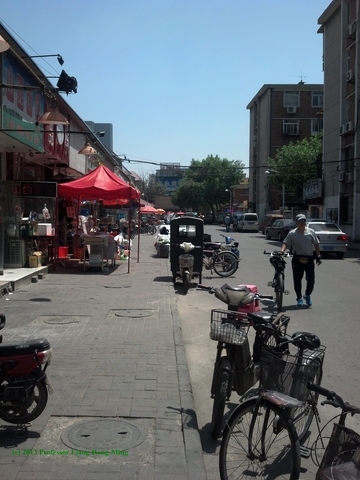 Walking down the street is the part of my day that lets me know loud and clear that I am in China. By watching the traffic, the cars and bicycles, the people on the sidewalk and the clothing styles, I feel like I get a glimpse into other people’s daily lives. Oddly enough, Chinese traffic makes sense to me. The cars move fast and don’t strictly follow the rules of the road as they might in America; here the lines on the road are taken as mere suggestions. Drivers don’t think twice about moving into the lane of oncoming traffic to pass a car that’s going a little slower. The honking was definitely something to get used to when I first arrived in China. Sometimes drivers honk because they’re disgruntled or annoyed at other drivers, but sometimes they just honk to let someone know they’re there. While traffic seems hectic and chaotic at times, I have yet to see a car accident. Cars, taxis, and buses aren’t the only vehicles sharing the street. Bikes are still a common sight in China, and even as more and more people buy cars, I don’t think bikes will fade out as a mode of transportation anytime soon. There are still significantly more bikes on the road in China than anywhere I’ve been in America. Scooters and motorized bikes share the bike lane as well, though I have yet to see a full size motorcycle such as a Harley. Motor bikes are also the main way fast food is delivered (in China, McDonald’s delivers!). People also share bikes here, with the passenger riding on a smaller seat on the back. I’ve seem a mom, dad, and toddler all on one bicycle. There are also other vehicles that I don’t exactly know how to describe— they seem like carts attached to a motor bike carrying a load. I believe these are driven mainly by vendors transporting their merchandise. Speaking from the point of view of a pedestrian, people-watching is the best part for me. On the side walk, women have incredible style. There’s a huge range of fashion to be seen: while some young women wear professional attire, others wear clothes a little girl might wear. Some are clearly professionals – wearing gorgeous dresses, hats, glamorous nails, sun-blocking umbrellas, and of course, high heels. It’s even more incredible when you consider that many women dress like this every day. 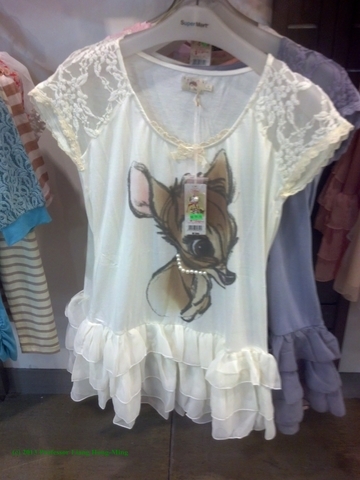 I notice a popular style for girls is to wear things that I can only describe as cute or adorable with animated animals and frills on the front. English phrases are a common sight on shirts for both boys and girls. Most of the English phrases make sense, but some are just a little off. For example, my favorite shirt that I’ve seen says “More Respect, Less Attack”. It’s not necessarily incorrect, but it sounds a little strange in English. One stereotype I know exists in America about Chinese people is that they are very conservative with their affections in public, but I don’t find this to be the case. Sure, I don’t see kissing in public very often, but people hold hands, hug, wrap their arms around each other on the street, on the subway, and in other public places. It’s popular to show your affection for you boyfriend, girlfriend, or friend by wearing matching shirts or outfits. This is especially common among young people. One thing I don’t quite understand yet is why cars drive on the sidewalk. They feel free to drive on the wide brick sidewalks and park if they need to, or simply to go opposite the main traffic. When cars, bikes, motorbikes, and pedestrians all share the sidewalk, I’m at a loss as to who has the right-of-way. . . Your experience sound exceptionally interesting and intimidating. Imagining the way traffic operates is anxiety inducing; though I am happy you have not witnessed any car accidents despite that. The fashion sounds fairly common from what I have heard through friends, blogs, and foreign televisions – especially ‘couple clothing’. Thank you for sharing.